Suzuki Alto (スズキ・アルト, Suzuki Aruto) is a kei car built by Suzuki. Its selling points have long included a low price and good fuel economy. The model, currently in its eighth generation, was first introduced in 1979 and has been built in many countries worldwide. The Alto badge has often been used on different cars in Japan and in export markets, where it is considered a city car. In Japan, the Alto badge was originally meant to be for the commercial use version of the Fronte passenger car. When introduced, the Alto was only available as a two-door "light van" and with bare-bones equipment. However, Suzuki generally did not use the "Fronte" badge in export, usually calling all versions "Alto" abroad. Most early export Altos were thus technically speaking rebadged Suzuki Frontes. These were exported with changes such as enlarged engines, sometimes modified bodywork. Thus the Japanese SS40 Fronte became the SS80 Alto with a 796 cc engine abroad. The Alto badge gradually took over in Japan as well, as the distinction between kei commercial vehicles and passenger cars was diminished in early 1989. The Fronte line was retired in March 1989. The Alto plate has been used on export versions of various Indian-built derivatives since the early 1990s, as neither cars are restricted by the kei rules and Indian cars are also considerably cheaper than Japanese-built ones. 1981–1984: SS40 Fronte with a 40 hp (30 kW) 796 cc three-cylinder engine (SS80F/G). 1984–1994: CA/CB91 Alto/Fronte (also referred to as SB308) with the same 40 PS (29 kW) F8B engine as the SS80. March 1994–2002: Maruti Zen (a wider version of the Suzuki Cervo Mode), with a 993 cc engine. 2002–2009: Maruti Alto (based on the HA12 Alto), with a 1061 cc engine. 2009–2014: Maruti Suzuki A-Star, with a 998 cc engine. Since 2014, the Suzuki Celerio has replaced the Alto in Europe and other export markets. Alto is thus a JDM-only badge for now. Suzuki Alto (SS80S), European market, note the big export bumpers and the 12-inch wheels. The first generation (SS30V/40V), introduced in May 1979, was a three-door cargo version of the Fronte passenger car, equipped with a folding rear seat. Front suspension comprised coils struts, with leaf springs at the back. The steering was of the recirculating ball type, and four-wheel drums were used. On introduction, the Alto received the T5B two-stroke 539 cc (32.9 cu in) (SS30) three-cylinder engine, producing 28 PS (21 kW) at 5500 rpm. The Alto was a "micro sensation" when introduced, largely due to its rock bottom price of ¥470,000 (circa $1,900 in 1979, at a time when the cheapest Ford Pinto cost $4,999 in the US). This low price was made possible by a number of Japanese special concessions for commercial vehicles: most notably, the engine did not require twin catalysts. Two less doors provided another saving, as did the exemption from commodity tax. The Alto's success changed the kei-car market, and other producers such as Subaru (with the "Family Rex") quickly followed suit with cut-price "commercial" vehicles that were really intended for private use. The Alto helped Suzuki move into seventh place in Japanese production for cars and trucks. In the last full year of production for this generation, it was still by far the best selling Kei car, with the Alto outselling the Fronte at a rate of about five to two. In May 1980 a fully automatic two-speed option was added to the Alto SS30. In January 1981, the F5A four-stroke 543 cc (33.1 cu in) from the Fronte was also made available for the Alto; although it only had a single-barrel carburettor, it too put out 28 PS (21 kW) but at 6,000 rpm. Torque was considerably lower, down from 5.3 to 4.2 kg⋅m (52 to 41 N⋅m; 38 to 30 lb⋅ft). 1981 saw also the year that it became available in the United Kingdom, as Suzuki began selling cars there that year. In export markets, the Alto name was used for the passenger car versions (chassis codes with trailing letter "S") as well as on commercials (ending in "V"), while the van was marketed as the "Suzuki Hatch" in Australia. The four-doors were not proper hatchbacks, only featuring an opening rear window. Export cars were also available with twelve-inch wheels, unlike the domestic versions which only used ten-inch units until the introduction of the 4WD version in October 1983. The 4WD "Snow Liner" thus gained an extra 2.5 cm (1 in) of ground clearance. Most export Altos were passenger car versions (which used the "Fronte" badge in the Japanese domestic markets), and usually received the 796 cc (48.6 cu in) F8B engine and the SS80 chassis code. The 800 had better performance, and due to the higher possible gearing it saw an improved gas mileage as well - by about ten percent according to Suzuki. The SS80 was also built in New Zealand, by South Pacific Suzuki Assemblers at a rate of six per day. It was introduced in New Zealand in March 1980. In Australia, the Suzuki Hatch, sold as a two-seat commercial vehicle to be taxed at 35 percent duty (as opposed to 57.5 percent for passenger cars) offered a standard 543 cc (33.1 cu in) engine with 19.2 kW (26.1 PS) and 35 N⋅m (26 lb⋅ft). The side rear windows were covered with fibreglass by default, with a glass panels optional. The only other option was air conditioning. M. W. Suzuki in Victoria, Suzuki's distributor for Southern Australia, introduced the "800 pack" in January 1981 that included the 796 cc (48.6 cu in) motor. The pack also added steel-belt radial tyres, 12-inch wheels (up from 10-inch), front-wheel disc brakes and bolder bumpers front and rear. While Suzuki held on to the two-stroke engine concept for a half decade longer than any of its Japanese competitors, eventually market pressures and ever tightening emissions regulations spelled its end in the Alto by September 1981. The Jimny, however, did use the same 539 cc (32.9 cu in) engine (called LJ50 in the Jimny) as late as 1987. The second generation (CA71) was introduced in September 1984. This generation Alto echoed the design of the GM M-platform that underpinned the 1983 Suzuki Cultus. It continued with the F5A engine of the SS40, but also became available with turbocharged and multi-valve engines thereof, mainly in the "Works" series. In December 1984 a four-wheel-drive version (CC71) was added. Performance versions of the Alto first appear in September 1985 when a fuel injected and turbocharged engine was made available. It gradually acquired more performance-related modifications until the Works version was introduced in February 1987. This was the first kei car to reach the legal limit of 64 PS (47 kW). It acquired considerable popularity, with models of it still made by Fujimi. A five-door body became available in October 1985. This was superficially identical to that of the Fronte's, but the rear seat folded flat and it was technically speaking a commercial vehicle. This was the first five-door commercial of its kind in Japan, and was originally a special model introduced to celebrate the one millionth Alto produced. In July 1986 the CA/CC71 received a rather thorough facelift. New wraparound headlights, a new dash and interior heralded the new available ITL rear suspension (Isolated Trailing Link), a three-link rigid setup. Some lower end models retained the earlier leaf sprung rigid axle; those with ITL received the CA/CC72 chassis code. A "Walkthrough Van" was introduced in January 1987, while at the other end of the spectrum, the personal coupé Cervo on the CA/CC72 base was introduced in 1988 with a new 547 cc (33.4 cu in) F5B engine. In August 1987, higher spec Altos became available with a three-speed automatic rather than the two-speed unit that had been used before. Most export markets received the passenger car version, which would have been badged "Suzuki Fronte" in Japan, but were usually sold as Altos abroad. When equipped with the 543 cc F5A engine, the export model code is SB305. Most export cars received the larger (0.8 litres) F8B engine and the SB308 model code. The 796 cc, 40 hp (30 kW) F8B-engined CA/CB91 was sold in Europe with either a four-speed manual or two-speed automatic transmission. Export Altos were technically speaking Frontes, as this was the name used for passenger versions in Japan. They received larger bumpers, making them 105 mm (4.1 in) longer and 10 mm (0.4 in) wider. European Altos received the same facelift as the CA/CB72 did in late 1986, followed by a market specific facelift in January 1988, unveiled at the Brussels Motor Show. This model remained in production (latterly by Maruti Udyog) for the European market until 1993, when it was replaced by an also Maruti-built 1-litre version of the Cervo Mode, which was sold as the Alto until 2002. The Maruti 800 did continue to be available under its own name in Europe until 2004, when it could no longer pass emissions and safety requirements. While the car has been long retired in other markets, it remained in production in Pakistan under the moniker Suzuki Mehran. The Pakistani version  is essentially a simplified basic rebadged second-generation Suzuki Alto CA/CB91 which was sold in the Japanese and European market from 1984-1988. 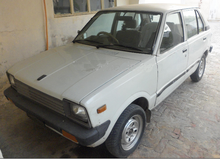 The Mehran had been in production due to its cost effective nature and cheap parts availability. In March 2019, The moniker Mehran officially ended it's production after 40 years of production. Around 1990, the China Ordnance Industries Corporation (COIC, a predecessor company to Norinco) purchased the complete rights and all machinery for manufacturing the SB308 Alto from Suzuki. COIC charged four hitherto military enterprises with manufacturing the Alto: Chongqing Chang'an, Jilin Jiangbei, Xiangtan Jiangnan, and Xi'an Qinchuan were all to switch over to civilian manufacture. Chongqing Chang'an were able to adapt Suzuki's Just-in-time manufacturing (JIT) methods and were the first to market the car, in 1992. Jilin Jiangbei lost money on each car built and ended up on the brink of bankruptcy; Xiangtan Jiangnan never got production off the ground, while Xi'an Qinchuan suffered a fire and chose to develop their own design instead (a car called the Qinchuan Flyer; the company was later made part of BYD Auto). Chang'an ended up without real competition in the segment. Chang'an's productivity set a new standard for the Chinese auto industry. In 1993 Chang'an Motors took over production of the Alto. The Chang'an Suzuki SC7080 Alto was produced with the same F8B engine as used in other export markets, and was replaced by the facelifted SC7081 Alto/City Baby/Little Prince/Happy Prince in 2001. The top of the Line Happy Prince, discontinued in 2007, used the sportier looking front bumper, grille, and bonnet of the Alto Works. Citing lower sales and stating that upgrading the design to meet new regulations would not be cost effective, Chang'an ended production of the old Alto on 28 July 2008. A total of 504,861 were built by Chang'an Suzuki between 1993 and 2008. Another version called JN Auto has been built by Jiangnan Auto. As of Dec, 2010 Zotye's Jiangnan Alto is one of the cheapest car in the world, with a price tag of $2830. The entry-level model comes with the 796 cc (48.6 cu in) F8B three-cylinder 36 PS (26.5 kW). An inline-four engine with a displacement of 1,051 cc (64.1 cu in) and an output of 52 PS (38.5 kW) was also available. The Jiangnan TT was eventually replaced by the Zotye Z100. The third generation (CL/CM11) replaced the CA71 in September 1988. This was the last generation of Alto to have an associated Fronte model. It had strikingly angular styling, with an unusual glazed C-pillar on the 5-door. Another curiosity of this generation was the availability of a version with a sliding door on the driver's side, the "Slide Slim", intended to simplify entering and exiting in tight spaces. It also made egress easier for the old and the infirm. The Slide Slim has two regular doors on the passenger (left) side. When the Fronte name was discontinued in October 1989, the passenger car versions (CN/CP11) became Altos. Initially the CL11 used the 12-valve 42 PS (31 kW) F5B engine known from the SS71 Cervo, but with an added 34 PS (25 kW) 6-valve version in lower-spec versions. A 46 PS (34 kW) DOHC version was also available in the Twin Cam Rl. Passenger car versions had the same engines, but all with 2 PS less due to more stringent emissions controls. The fuel-injected, 12-valve, turbocharged Works models came with an SOHC 58 PS (43 kW) engine (FF S/X or 4WD S/R) or a 64 PS (47 kW) DOHC version (FF RS/X or 4WD RS/R). The front-wheel-drive Works' were available with a 3-speed automatic in addition to the standard 5-speed manual. This generation was generally not exported, and was never built by Suzuki with engines of more than 660 cc nor with left-hand-drive. It arrived late in export markets, only by 1993 after the earlier export version had been retired, and it was only seen in a very few places, namely New Zealand, Hong Kong, and Singapore. In most countries the earlier Alto/Fronte was replaced by an Alto-badged Maruti Zen (an Indian-built Suzuki Cervo Mode). With a 0.8-liter engine the CL11 Alto was built with left-hand-drive in South Korea, Poland, Romania, and Uzbekistan as the Daewoo Tico, and also in China by Anchi. When the Kei car standards were changed in 1990, the engine was upgraded to the 657 cc (40.1 cu in) (F6A), and the Alto became the CL/CM/CN/CP21 in the process. The new standards also allowed for a 100 mm (3.9 in) longer car, which meant new bigger front and rear bumper, and new headlights and grille. Lower grade Van versions received a 6-valve 36 PS (26 kW) engine, while passenger car versions (and the l'Èpo Van) got a single-cam 12-valve 42 PS (31 kW) version. This engine was upgraded to 52 PS (38 kW) in January 1991. 4WD versions with the three-speed automatic transmission were fuel-injected and offered three more horsepower. The F6A-engined Works RS/X and RS/R still claimed the legally limited 64 PS (47 kW) with 8.7 kg⋅m (63 lb⋅ft) of torque, but the lower grade i.e. Turbo (introduced in July) received a 6-valve SOHC-engine producing 61 PS (45 kW) and 9.2 kg⋅m (67 lb⋅ft) of torque (slightly more than the high-revving, twin cam RS). Reflecting decreased tax benefits for commercial Kei cars, the Works series were now classified as passenger vehicles, allowing for a real back seat. The lineup was reorganised in January 1991, with a lot of new engine specifications. In September 1991, responding to increasing safety demands, the Alto received side impact protection. Also, the vertical door handles (see picture on the right) on three-door versions were replaced by traditional horizontal ones. The re-engineering was extensive enough to necessitate new model codes, with vans becoming CL/CM22 (FF/4WD) and passenger versions (including the Works) now called CR/CS22. While most of the engines remained as they were, the Alto Van's engines were updated with power output up to 40 PS (29 kW). This was the model that reached limited exports. The New Zealand version was mostly the same as the Japanese market five-door van model, with a cargo oriented bare-bones trim combined with the rather soft Japanese suspension settings and light, low-geared steering. Unlike the Japanese models, however, this low spec was coupled to the (carbureted) four-valve engine with 38.2 kW (52 PS; 51 hp) and a standard five-speed transmission. A three-speed automatic was also available. In a period test, this model reached the 0–100 km/h benchmark in 15.9 seconds and a top speed of 148 km/h (92 mph). A very limited production version for competition purposes arrived in 1992, called the Alto Works R. This was a lightened, strict two-seater with four-wheel-drive, a close-ratio five-speed transmission, and a tuned engine - although official output remained 64 PS (47 kW), as required by the Kei regulations. The car has an adjusted ECU and a free-flow Suzuki Sport RHB31 turbocharger, as well as a different throttle body. Less than a hundred were built, although it continued to be available until the arrival of the next generation Alto. This model, without a backseat and with racing bucket seats in front, was classified as a van and accordingly received the CM22V chassis code, unlike the usual Alto Works. The undercoating and most creature comforts were deleted (although air conditioning remained an option) and the car sat on steel wheels, which made the car about 20 kg (44.09245 lb) lighter than a regular Works RS/R. Suzuki also produced a version of the Alto, known as the Alto Hustle, with a raised roof behind the front seats. This was unusual in that it used a modification of the five-door Alto's body rather than a completely new body, allowing Suzuki to market it as part of the Alto family. Its appearance was similar to the Nissan AD Max van. The Hustle was short-lived, only being offered between November 1991 and October 1993. The engine options were mostly as for other Altos, albeit without the turbocharged offerings. The standard model has 40 PS (29 kW), while a four-valve version has 52 or 55 PS (38 or 40 kW) depending on if it was carburetted or fuel injected. The lowest and highest powered versions were also available with four-wheel-drive, and there was a bare bones two-seater version (Hu-2) on offer. The fourth generation (HA11) appeared in November 1994. The design was marked by simplicity, as Suzuki strived to return to making a more basic car. The Slide Slim model, with its sliding door on one side, was discontinued, as were some of the higher end versions of the third generation Alto such as the Regina. The new Wagon R took over much of the more expensive Alto's market share, leaving the Alto to compete at the lower end of the market. The fourth generation was generally not exported, with most foreign markets instead receiving Alto-badged versions of the Indian-built Maruti Zen. The 657 cc (40.1 cu in) F6A engines were joined by a new high-performance 64 PS (47 kW) 658 cc (40.2 cu in) K6A (HA21) for the Works RS/Z model. Front-wheel drive or full-time four-wheel drive were offered, in three- or five-door sedans or as a three-door van. The Works model was also reclassified as a sedan, as many advantages for light commercial cars had vanished. The tailgate and rear doors are still fairly angular, but the front was more rounded than previous models. In March 1995 the Alto Sv model appeared. This was a special fuel economy model, well equipped with air conditioning, power steering, AM/FM cassette stereo, etc. The "Alto With", a limited sporty edition based on the well-equipped Sf model (also with four-wheel drive) with a front and rear spoiler, appeared in June 1995. In July a version of the Works Turbo ie/s called the Limited appeared; this had special stereo equipment and keyless entry and power locks. It was developed by AddZest (Clarion). In November 1995 the Works model received a new grille and front bumper, with a bigger opening. In May 1996 the l'Èpo model appeared, this three or five-door sedan was based on the Se/Le model and was also available with four-wheel drive. This version received full power equipment, remote key entry, distinctly upholstered full fabric seats (rather than the vinyl backed units of the Se/Le), hubcaps and many other amenities. The Works Turbo F Limited ie/s version appeared in November 1996, offering a carbon panel, special alloy wheels, and more spoilers. In April 1997 the range received a facelift with side door impact beams and a new front design, with new marker lights beneath the headlights and a redesigned trunklid. The Alto l'Èpo P2 appeared at the same time, using a fuel injected version of the 12-valve engine with 55 PS (40 kW) rather than the usual 52 PS (38 kW) carburetted unit. All 12-valve models fitted with four-wheel drive and automatic transmission received a 55 PS (40 kW) fuel injected version, as was the case since the third generation Alto. The l'Èpo models also received a new (optional) airbag. The Works models only received smaller changes at this time, such as white-backed meters in the dashboard. The RS/Z also received 14-inch wheels and fuller equipment. In November 1997 the even better equipped l'Èpo Limited model appeared, with a high power CD stereo etc. [vague] In January 1998 the Works Sports Limited model appeared, a Works ie/s with 14-inch wheels and special seats. In May the "Alto Beam" special model appeared, with UV reflecting glass and extra large seats. In March 1995 a second iteration of the Works R arrived, again a limited production vehicle with a close-ratio transmission, built for competition purposes. Like the first Works R it was built in less than one-hundred examples, but this one appeared in two series: The Series 2 had sold out by October 1995 and the third series was available from January until September 1998. Unlike the first Works R, this one was a passenger car version (chassis code HB21S) and received the new, lightweight K6A engine. It was lighter than the regular Works RS/R, and the engine was considerably more powerful - although claimed output remained 64 PS (47 kW) as per the regulations, torque increased from 10.5 to 11.0 kgm (at 3500 rpm for the Series 2, 4000 rpm for the Series 3). Period sources state that the engine's actual output was at least 80 PS (59 kW). The engine received considerable changes over the regular Works, many more than the first Works R. The throttle body and camshafts were different, while a larger HT06/RA12 turbocharger was fitted, along with 260 cc injectors and a larger intercooler (necessitating a hood scoop nearly as wide as the bonnet itself). The weight savings were only 10 kg (22 lb) over the Works RS/Z for this model. This was the end of the Works R series of cars, foreshadowing the end of the Works badge in 2000. The fifth-generation Alto (HA12/22) was introduced in October 1998. The styling was generally more rounded, the shape of the cabin showing the Alto's relationship with the new Suzuki Kei. The 658 cc K6A engine was now also available without a turbocharger, joining the turbocharged version and the familiar 657 cc F6A engines. The turbocharged Works models were available with a 60 hp F6A engine (i.e., 5MT/3AT and FF or 4WD) or a 64 PS VVT K6A (RS/Z, 5MT and FF or 4WD). The front-wheel-drive RS/Z was sold with a non-VVT K6A engine when in combination with a 4-speed automatic transmission, it too with a claimed 64 PS. In December 2000, the Works versions were discontinued, as the Alto was realigned as an economy version. The Suzuki Kei Sports picked up the Works' mantle. Several derivatives were produced from this generation. Suzuki produced two "classic-style" versions: the Alto C with a deep chrome grille and a curious headlamp arrangement by which circular main lamps were joined with ovoid sidelights and indicators, which was shared with the Alto Works; and the Alto C2 which had separate headlamps and sidelights and a wider grille. Mazda also sold the standard Alto as the Carol, and Mitsuoka used the Carol as a basis for their Ray. Pakistani production began in 2000 utilizing the old carburetted F10A four-cylinder engine. The car was sold as the Chevrolet Alto in Colombia and Ecuador, where it was equipped with a one-litre, sixteen-valve inline-four engine. In December 2000, the fifth generation Alto received a thorough facelift, becoming the HA23. As the Works was discontinued, naturally aspirated versions of the K6A became the only ones on offer, with either 54 PS (40 kW) or 46 PS (34 kW) in an especially efficient lean-burn iteration. Front- or four-wheel-drive, manual and automatic transmissions were available (no more CVT), in either a 3- or 5-door hatchback body. A 3-door van version remained available. The Maruti Alto is the Indian-built version of the fifth generation Alto, manufactured by Maruti Suzuki. It was launched in the local Indian market on 27 September 2000 although the Alto nameplate had been successfully used to export the Maruti Zen to Europe from India since around 1994 having captured over 40% market share in Belgium and 33% in Netherlands by 1998. It is the best-selling hatchback in India. Since 2006, it is India's largest selling car and crossed the 1 million production figure in February 2008 becoming the third Maruti model to cross the million mark in India after Maruti 800 and Maruti Omni and fourth overall joining Hyundai Santro. This model, using the fuel injected 1061 cc F10D engine, entered the European market at the March 2002 Geneva Motor Show. Being built in India by Maruti, it was only available with five doors, unlike earlier Altos in Europe. Until the late 2010 introduction of the K10 Alto, it was powered by a three-cylinder 796 cc (48.6 cu in) gasoline engine with 4 valves per cylinder, MPFI and a 32bit ECM. All models have a five-speed manual transmission. There also used to be a VX/VXi model with a four-cylinder 1,061 cc (64.7 cu in) engine with 64 PS (47 kW) and 80 N⋅m (8 kg⋅m; 59 lb⋅ft) torque, launched in April 2001. This has now been discontinued, although it was sold for longer in certain European countries. The VX model also featured a tachometer not found in lesser Altos. Maruti Suzuki India launched a new version of the first generation Alto in the Indian auto market in August 2010, the Alto K10. The new Maruti Alto K10 is equipped with the company's 1.0-L, K-series DOHC inline-three petrol engine which also currently powers the Celerio and Wagon R, mated to a five-speed manual transmission. The 998 cc (60.9 cu in) K10B engine delivers 68 PS (50 kW) of maximum power at 6200 rpm with 90 N⋅m (66 lb⋅ft; 9 kg⋅m) of maximum torque at 3200 rpm. The K10 has a redesigned front end, with more sculpted headlights. This spelled the end for the F10-engined model, while the F8-engined Alto was replaced by the all new Alto 800 in late 2012. The Alto K10 remained in production until 2014. The Alto was seen as a natural successor to the time-tested and equally popular Maruti 800 (MB 308). It contained all the plus points that the 800 offered Indian car-buyers, in addition to features such as power-steering, power-assisted braking and a 5th gear that the 800 did not normally have. The popularity of the Alto has steadily increased over the past few years, mainly due to the aggressive pricing. This reduction in prices has mainly come in due to the reduction in excise duty over time. Alto became the first car in India to sell over 200,000 units in a single financial year, the last 100,000 units being sold in 5 months. Alto was also the only car to sell over 22,000 units in a single month. Maruti's vast network of dealerships and Maruti Authorized Service Centers (MASS) have also contributed towards this massive popularity in the Indian entry-level automobile market. The sixth generation (HA24) was introduced in 2004. The bonnet and headlamps curved down at the front, giving a similar effect to the Toyota WiLL Vi or the Citroën C2. The Alto was realigned as a less costly car to accommodate new models such as the Cervo and Alto Lapin. The more powerful engines were moved into the other more upmarket versions like the Suzuki Kei Works and Alto Lapin SS, leaving the Alto with only a 54 PS (53 hp; 40 kW) version. In Japan, this version of the Alto was rebadged as the Nissan Pino and Mazda Carol. The seventh generation was first shown at the 2009 Tokyo Motor Show alongside its sister car, the Mazda Carol. It is available with a 660 cubic centimetres (40 cu in) engine, a 5-speed manual, a 4-speed automatic or a CVT transmission, in FWD or 4WD variants. Under the Japanese 10-15 test cycle, the front-wheel-drive with CVT achieves 24.5 km/litre fuel economy. In 2011, Suzuki launched the Alto Eco variant, that features the R06A engine lifted from the Suzuki MR Wagon and an idling stop function. It is capable of reaching the fuel economy of 30.2 km/L (71MPG) based on Japan's JC08 Mode test cycle (32 km/L under 10-15 test cycle). This is .2 km/L higher than the Daihatsu Mira e:S.
In 2013, the Alto Eco was updated with the addition of Suzuki's ENE-CHARGE system, first applied on the fifth-generation Wagon R. With this technology, fuel economy has now improved to 33.0 km/L based on Japan's JC08 Mode test cycle. The Suzuki Alto available in international market is known in India as the Maruti Suzuki A-Star (short for "Alto-Star"), but is also known as the Suzuki Celerio in some other countries. It was launched in December 2008 by Suzuki's Indian subsidiary Maruti Suzuki. It is actually a different car from the Japanese market one although they share the same name. The car is manufactured exclusively in Haryana, India and is exported worldwide. It is available in some European markets with a somewhat different front end as the Nissan Pixo. The car was rolled out to the Indian customers in December 2008 and exports began in April 2009. With a totally new body and engine, Maruti hopes to bring freshness to the Indian car market, of which it already holds a major share. The 998 cc (60.9 cu in) K10B inline-three engine was developed especially for the new car, and is also used for the Nissan Pixo. The A-Star has a fresh new dashboard, with an available unique protruding tachometer besides the usual meter cowl (only in the ZXi trim). In February 2014, Maruti Suzuki unveiled an all-new Celerio, which replaces the A-Star and Zen Estilo. The European market version of the Maruti Suzuki A-Star was unveiled at the 2008 Paris Motor Show. It was developed to be a global car and will be made at Maruti Suzuki's plant in Manesar, Haryana, India. It is stylistically based on the Suzuki A-Star Concept. The Alto was conceived as a response to high petrol prices and global warming. It was released as an eco-friendly car priced from £6,795 OTR. The Nissan Pixo is the "sister car" to the Suzuki Alto featuring a few notable differences, including the main grille and headlamps. It was revealed at the 2008 Paris Motor Show and has been available in Europe since 2009. Because it is developed and built cheaply in India, the Pixo can be bought new for just under £7,000. In the summer of 2013 the Pixo was withdrawn from UK showrooms. A new version of the Alto called the Alto 800 was released in the Indian car market on 16 October 2012. The Alto 800 has all-new bodywork and interiors. It replaced the first generation Maruti Alto (although the predecessor continued to be produced for a little longer), and while keeping the 796 cc (48.6 cu in) engine, there have been several modifications. The price of the Alto, already India's best-selling car, was actually lowered with the model change. Various methods were found to lower the price, including the lowering of the weight of each individual component by one gram each, and also by building their own robots for manufacturing the car. This is also sold as the Suzuki Alto 800 in many export markets. In May 2016, refurbished version of Alto 800 has been introduced with notable changes to the exteriors, interiors, features and specifications. The new Maruti Alto 800 comes with an improved fuel efficiency. It is now capable of returning a mileage of 24.7 kmpl. Maruti Suzuki India then launched a K10-powered version of the second generation Alto on 3 November 2014. Introduced at a base price of Rs. 3.06 Lakh, the next gen Alto K10 comes with multiple exterior and interiors updates, however mechanically it remains same. The car is a somewhat upgraded version of the Alto 800 with a new front fascia comprising a new chrome fitted front grille, new swept back headlamps, and a redesigned bonnet line. There are also amendments for tail lights, restructuring of bumpers, 13 inch wheels, ORVMs, door moulding and some other minor modifications. Interiors too have been updated, with a new dashboard, three-spoke steering wheel, refined upholstery, black finished music system and a better looking instrument cluster. Other added features inside the car include front power windows, 12 V power socket, internally adjustable ORVMs, headlamp warning buzzer, key off reminder and gearshift indicator. Powering the 2015 Alto K10 is the same 1.0-litre K10B engine that also powers the Celerio and Wagon R. However, this time it has been tuned to provide better fuel economy, and the new Alto K10 returns an ARAI-certified fuel economy of 24.06 kmpl, 15 per cent better than the outgoing model.The Alto K10 Facelift is available with two different transmission; 5-speed manual and 5-speed AGS (Auto Gear Shift) Transmission. The AGS is an automated manual transmission technology, which shifts gear with the help of an ECU mapped actuator on pre-defined engine speeds. It also allows driver to shift gears when required. The eighth generation Alto was introduced in December 2014 in Japan, and has a more retro style. The new Alto was designed to have a very low fuel consumption, and is 60 kg (132 lb) lighter than the outgoing model. This was achieved using "Suzuki Green Technology" for the body and the engine, and resulted in the car having a claimed fuel consumption of 37 km/L. The new Alto is available with either a naturally-aspirated 658 cc (40.2 cu in) inline-three engine, or a turbocharged version of the same power unit. It is available with either a 5-speed manual transmission, 5-speed semi-automatic transmission or a CVT automatic transmission. A Turbo RS variant started production in March 2015 which was followed by a performance-tuned Works edition by the end of the year. The eight generation Alto was revealed for the Pakistani market on 12 April 2019 at the Pakistan Auto Parts Show (PAPS). The works version of the fourth generation model appears alongside many of its kei sports car contemporaries in Kat's Run: Zen-Nippon K Car Senshuken for the Super Famicom. ^ Quattroruote: Tutte le Auto del Mondo 1994 (in Italian). Milano: Editoriale Domus S.p.A. 1994. p. 554. ^ "European car sales data: Suzuki Alto". Left Lane. Retrieved 18 August 2016. ^ "Four Million Production of Kosai ALTO". Global Suzuki. 7 August 2001. Retrieved 17 July 2013. ^ "Suzuki's Biggest Unveil of the Year". Suzuki’s Biggest Unveil of the Year. Retrieved 10 April 2019. ^ a b c d e f "Suzuki Hatch". Unique Cars and Parts. Retrieved 26 January 2014. ^ Nakamura, Takahito & Piazzi, Filippo (July – September 1984). Marin, Gianni (ed.). "Suzuki: Come ti scodello la "Panda 4x4"" [Suzuki: Dishing it out to the Panda 4x4]. Auto in Fuoristrada (in Italian). Milan: Rusconi Editore. 3 (7): 55. ^ Quattroruote: Tutte le Auto del Mondo 1992. Milano: Editoriale Domus S.p.A. 1992. pp. 974–976. ^ Bhargava, R. C.; Seetha (2010). The Maruti Story. Noida, India: Collins Business. pp. 116–117. ISBN 9788172237806. ^ "Suzuki Alto Versions Pakistan", Islamabad, 26 March 2017. Retrieved on 26 March 2017. ^ a b 刘文俊 (Liu Wenjun) (24 August 2009). "奥拓：中国微车传奇" [Alto: Chinese microcar legend]. auto163.com (in Chinese). NetEase. Archived from the original on 2 September 2009. ^ 王勐 (Wang Meng) (21 November 2016). "你再不老我就疯了看汽车界的不老男神" [You're not old - crazy about old dream cars] (in Chinese). autohome.com.cn. Archived from the original on 29 July 2017. ^ "Zotye to Challenge Tata Nano with a $2,765 Alto". ChinaAutoWeb.com. ^ "Jiangnan Alto, China's Cheapest Car from Zotye, Beats Tata Nano". ChinaAutoWeb.com. Retrieved 13 January 2010. ^ a b "Alto". U's Station on the Net - Short Catalog by Model. Suzuki Motor Corporation. Archived from the original on 13 July 2010. ^ Anderson, Donn, ed. (April 1993). "Buzzy Bee!". New Zealand Car. Auckland, New Zealand: Accent Publishing Cnr. 7 (6): 40. ISSN 0113-0196. ^ "Goo-net Catalog: Suzuki Alto 1991年9月". 'Goo-net'. Archived from the original on 13 July 2010. ^ a b c d "スズキアルトワークスR(H6年式 V-CM22V) 主要諸元" [1994 Suzuki Alto Works R (V-CM22V) specifications]. わくわくわーく (in Japanese). Archived from the original on 20 January 2018. ^ "僕のアルトワークスＲのスペックです。" [The specifications of my Alto Works R]. Satoru's Home Page (in Japanese). ^ "Suzuki Alto C pictures 1999". English.auto.vl.ru. Archived from the original on 4 December 2010. Retrieved 4 April 2011. ^ "Suzuki Works pictures 1998". English.auto.vl.ru. Archived from the original on 3 December 2010. Retrieved 4 April 2011. ^ "Suzuki Alto C2 pictures 2001". English.auto.vl.ru. Archived from the original on 25 November 2010. Retrieved 4 April 2011. ^ "Alto HA23S HA23V". U's Station on the Net - Short Catalog by Model. Suzuki Motor Corporation. Archived from the original on 14 July 2010. ^ a b "Maruti Alto crosses one million units". Maruti Suzuki India Limited. 14 February 2008. Retrieved 26 January 2009. ^ "Maruti's exports cross half a million". The Hindu Business Line. 28 February 2008. Archived from the original on 2 May 2010. Retrieved 26 January 2009. ^ "Maruti Alto is India's highest selling car". domain-b.com. 2 November 2006. Retrieved 26 January 2009. ^ "The Continental Divide: The Most Popular Cars by Continent". Automotoportal.com. Retrieved 17 September 2011. ^ Mazur, Eligiusz, ed. (2002). Katalog Samochody Świata 2003 [World Car Catalogue 2003]. Warsaw, Poland: Print Shops Prego - Polska Sp. z o.o. p. 198. ISSN 1234-8198. ^ Paul Tan (17 December 2009). "JDM Mazda Carol based on Suzuki Alto". Paul Tan.org. ^ "スズキ、「アルト エコ」を一部改良し、低燃費33.0km/L（2WD車）を達成" [Achieve Suzuki, improve some of the "Alto Eco", a low fuel consumption 33.0km / L (2WD car)] (in Japanese). Autoc one. 20 February 2013. Retrieved 23 December 2014. ^ Chauhan, Chanchal Pal (7 February 2014). "Auto Expo 2014: Maruti Celerio hatchback launched at a starting price of Rs 3.90 lakh". The Economic Times. Retrieved 16 February 2014. ^ Mohan, Anand (14 February 2014). "Maruti Celerio: Competition Check". The Economic Times. Retrieved 16 February 2014. ^ Tan, Paul. "New Suzuki Alto images released, details to come". Paultan.org. Retrieved 17 September 2011. ^ "Suzuki Alto - The Newest Eco Friendly Car". Motoring-blog.com. 21 August 2008. Archived from the original on 31 March 2009. Retrieved 17 September 2011. ^ "New Nissan Pixo Car Review". Parkers. Retrieved 17 September 2011. ^ "Nissan at the 2008 Paris International Motor Show". Nissan. 12 September 2008. Archived from the original on 23 September 2012. ^ "New Nissan Pixo Car Review - Facts & Figures". Parkers. Retrieved 17 September 2011. ^ Bouchaàla, Faris (12 December 2018). "AUTOWEST 2018 / SUZUKI Cima Motors: Exposition des modèles made in DZ, commercialisation reportée" [Exhibition of vehicles made in DZ, sales postponed] (in French). Autobip. Archived from the original on 15 December 2018. ^ Sen, Sunny. "Honey, I shrunk the price: Maruti triggers price war with new Alto 800. Will it pay off?". Business Today. Living Media India Limited (2012-11–25). Retrieved 15 November 2012. ^ CarDekho Team. "Maruti Alto K10 Facelift Launched at Rs. 3.06 Lakh". CarDekho.com. Retrieved 5 November 2014. ^ a b c "Suzuki launches the all-new Alto minicar in Japan". Global Suzuki. 22 December 2014. Retrieved 23 December 2014. ^ a b K, Nithyanandh (13 December 2014). "Official images of 2015 Suzuki Alto kei car released – Japan". IndianAutosBlog. Retrieved 23 December 2014. ^ "スズキ株式会社". Suzuki Corporation. Suzuki Motor Corporation. Retrieved 22 November 2016. Wikimedia Commons has media related to Suzuki Alto.